When in medical school we learned that the pulmonary veins carry blood from the lungs to the heart like a simple pipe. Now we know that pulmonary veins previously thought to be inert pipes often hold the triggers for the the most common arrhythmia on earth, atrial fibrillation. Cardiac muscle bundles wrapped around these veins are highly arrhythmogenic, meaning they frequently give rise to the initiating triggers of atrial fib. The electrical signals from a multi-pole circular (Lasso) catheter inside the vein shows no connection to the rest of the atrium and when all 4 veins look similar we are done. So many of the “facts” we learned in medical school change or expand. 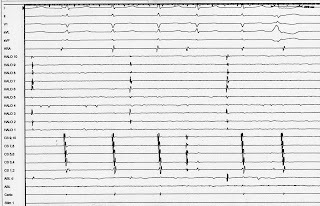 Who would have thought such a common, chaotic appearing, difficult to treat and often disabling arrhythmia could be so affected by electrically isolating a structure outside the heart. Even though doctoring is rendered less valuable and administrative issues rise, it is still gratifying to watch “squiggles” disappear and know that an illness is improved. thats why i love ep.